Most people would be hard-pressed to pinpoint the difference between a contact center vs. call center. Both are tools for customer service, and both involve the phone channels. That covers the similarities, so let’s look at the way these two models differ. Contact centers are a relatively new solution. They don’t have the negative reputation from which call centers often suffer. We don’t think that this reputation is necessarily justified, but more on that in a few paragraphs. First, let’s define these two terms, and explore their potential advantages and drawbacks for your business. Contact center vs. call center: what is a contact center? A contact center caters to the growing importance of providing omnichannel customer support. Increasingly, consumers expect the businesses they patron to be present on several channels, and to offer consistent, qualified service on all of them. Contact centers are also operated by outside companies, and are used to handle customer service but also to take on other activities such as telemarketing, debt collection, and billing services. Contact centers have been supported by mathematical models such as queuing theory and operations research, which consider them to be a way to solve a wide variety of optimization problems. Contact centers are equipped with features designed to distribute calls efficiently, in order to maximize the number of fielded calls while keeping customer satisfaction high. A good example of such a feature is Interactive Voice Response, which boosts first call resolution by directing a call to the most competent agent. This allows your staff’s diverse skill-sets to be useful to your clients. Contact center managers can toggle their team members’ access and priorities for maximum efficiency in real time. Shared contacts and objectives mean that the contact center agents can work as a team, even though they are all manning individual stations (different channels, inbound or outbound calls, etc). This also allows for tighter security measures, and secure data. The structure of a contact center is necessarily flexible, in order to adapt to fluctuating call volumes and objectives. Contact centers often work using customized scripts for every customer interaction. This gives agents a framework for sales and support, and can help with confidence when tackling tricky situations. Scripts work over the phone, of course, but also for any channel covered by a particular contact center. Nevertheless, part of being a good contact center agent is being able to deviate from a script when the situation calls for improvisation. Contact centers monitor agent performance and customer satisfaction over several channels. These analytics are complex and multi-faceted, and the volume of data is so enormous that it can be difficult to draw meaningful conclusions. Therefore, choosing to focus on certain Key Performance Indicators is the way to making data-driven decisions for your contact center. Now that you know what the features of a contact center let’s briefly touch on what some of the common complaints about contact centers are. Language Barriers. One of the most common complaint of both call centers and contact centers is the language barrier which occurs when these centers are located overseas from the business which is outsourcing to them and their customers. With the advent of virtual call centers, a growing number of businesses are able to hire remote agents from everywhere in the world, and stay connected. This way, customers can always count on finding a suitable interlocutor. Lack of interdepartmental communication. Contact centers offer services over multiple channels, and everyone is taking different paths towards a common goal. However, a successful omnichannel strategy is difficult to pull off, and many businesses suffer from siloed departments. The live chat people aren’t communicating with the email guys, and the customer feels frustrated. Long wait times. Many contact centers have an automatic queuing system, which can lead to very long hold times. Contact center vs. call center: what is a call center? Call centers operate over the phone, their main channel of communication. Call centers are designed to handle a massive volume of calls. Generally call centers are used to handle customer service, technical support or sales. They can field inbound calls, perform outbound calls, or be a hybrid of the two. The flexibility of a call center means that you can blend the skills and roles of agents for accrued efficiency. Telemarketing. One of the most common uses for call centers is telemarketing as the cost of employing a cost center is always less expensive than hiring an in-house sales team. Fraud Prevention. Another great use of call centers is to engage in fraud prevention by having your team follow up on purchases and transactions. Collection. Having your team make collection calls can be a great way to consistently follow-up on debts without having to assign your in-house employees to it. Information Gathering (leads, feedback, etc). Lastly you may want to use your gather information on your leads, or customers by having them call and present short surveys in order to figure out what products and services would best serve their needs in the future. On premises call centers operate right in your offices, hardware, software, and infrastructure. Your team takes care of the installation, configuration, and maintenance of your PBX or IP PBX. Cloud based call centers work thanks to software hosted in the cloud by a service provider. Users only need a computer or smartphone with an internet connection to access the service. Virtual call centers differ from onsite ones because the upkeep is the responsibility of the service provider, so users can focus on running their own businesses. We’ve talked before about the comparison of these different types of call center models. For the purposes of this article, we’re going to focus the next section on comparing contact centers with virtual call centers rather than brick-and-mortar ones. Call centers are less and less often the incarnation of the rather depressing image from the beginning of this article. Many businesses are opting for virtual call centers over contact centers, and the main reason is specialization. The fact remains that omnichannel service is now an obligation for businesses. However, outsourcing to a contact center for all your support or sales needs is not the only possibility. Relying on the services of multiple, dedicated service providers for each channel is an alternative choice. Call centers provide the very same highly specialized features mentioned above, such as IVR, data analytics, and programmed call routing. However, they build on those features in order to make the phone channel the best it can be. Using call centers vs. contact centers as an example, let’s look at how using a dedicated call center specialist can mitigate the contact center complaints we touched upon earlier. A virtual call center allows you to employ people from all over the world, without necessarily delocalizing your operation. This means that your call center can employ agents who work remotely, from home, or who are mobile. Virtual call center agents only need a computer to access the service, which saves businesses money on material resources and office space. Partly for this reason, many businesses are opting to hire local but remote employees rather than ones stationed a world away. Consequently, your virtual call center can hire agents whose language skills serve a specific purpose. Customers will always find a welcome interlocutor, and your team will stay connected even if they’re operating from different areas. Speaking of which. The problem of many contact centers is the following: employees work towards a common goal, but fail to communicate internally. Customer service is segmented and teams fail to follow the customer journey across different channels. Using a virtual call center instead of a contact center fosters cooperation in the following ways. First, your virtual call center software, while specialized in one activity and function, is designed to work in tandem with other services. These concurrent services handle the other functions in your customer service strategy. Thanks to the power of computer-telephone integration it’s easier than ever to integrate the services you use to run your business. This includes phone, live chat, emails, helpdesk, CRM tools, script builders, feedback templates, etc. Every service is run, developed, and maintained by specialists, leaving your business to benefit from their expertise rather than trying to be on all fronts. Second, virtual call center software also encourages internal communication. All important information such a contacts, client histories, performance data, etc. are shared across teams and platforms. This encourages your team to work as a cohesive unit and stay on the same page. Moreover, displaying common goals and key indicators will further federate your team. Teams take advantage of collaborative call center features to help each other during calls. Managers can listen, jump in, or advise their team member without the person on the other line realizing it. Involved managers can give their team a hand, and give their support to agents in need to always better service the customer. The phone channel has a reputation for long wait times. Contact centers improve on an antiquated version of call centers, thanks to call distribution technology. However, virtual call center software providers work hard to improve the existing contact center model. 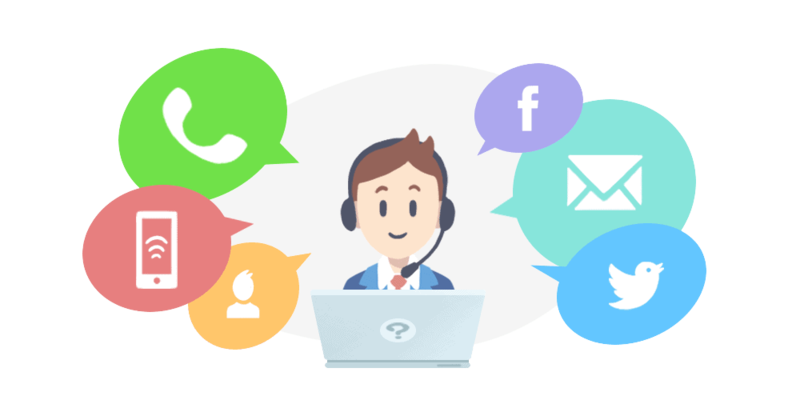 Relying on a call center service provider gives you access to a host of features designed to make the client favor the phone channel in of itself, and make it just as efficient as alternative channels. Such features include the automatic call-back, and click-to-call. The first adds a button to your website which lets customers call you with a single click. It eliminated dialling errors and expedites the process of getting in touch with your business. The second allows customers to request to be contacted at a time of their convenience, which lets them go about their day without waiting on hold. These three examples serve to show that for businesses of a certain size, and with a concern for customer centricity, prioritizing the alliance of a call center and associated alternative channel specialists can be a better and more personalized option than a contact center. Let’s briefly summarize the definition of contact centers, call centers, and how they compare with one another. Call centers field inbound calls, carry out outbound calls, and make the phone channel as efficient and optimized as possible. Call centers can handle large call volumes, and have a precise function. Contact centers have the same purpose, but they work over more channels than just the phone. Contact center agents work in different ways, towards a common goal. Ultimately, the decision between a contact center and call center depends on what will best suit your business: its scale, activity, and goals. Whether or not to provide support over multiple channels is a bit of a Hobson’s choice. However, you can choose how to carry out that plan. A contact center allows you more centralized control over your strategy. But a call center used in conjunction with equally specialized services for each channel is an alternative to keep in mind, as it will allow more flexibility, more cooperation, and a better focus on the customer. If you’d like to try out Aircall’s specialized virtual call center software, click here!